Let´s think about a wintry scene at the Schiphol Airport (Amsterdam, NL): De-icing machines surrounding an aircraft engulfed in clouds of smoke. Workers are using large-nozzle hosepipes to douse the aircraft in a special fluid that will de-ice it and keep it de-iced so that it can safely depart. As you may can imagine, the de-icing process takes time as well as manpower and significantly impacts the airport’s departure capacity. Knowledge Development Center Schiphol – a partnership between various governmental organizations and KLM – has requested the private weather service MeteoGroup to develop a model to help them better predict when ice can be expected to form on the wings of an aircraft. 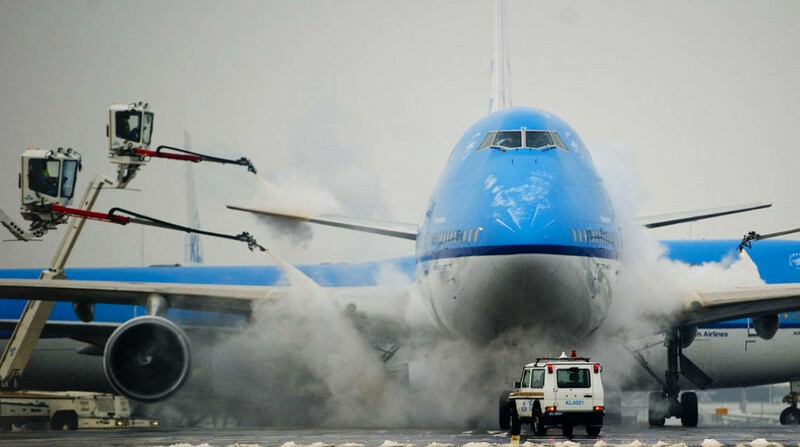 De-icing involves spraying an aircraft with a special fluid to remove ice from the wings. There are different fluids and treatments applied for different types of ice, such as snow, frost, or freezing rain. A coating is also applied to keep the aircraft ice-free for around 30 minutes so that it can safely depart. Naturally, performing this process properly and with due care takes time, materials, and staff. The earlier the airport knows how many aircraft need to be de-iced and when, the more efficiently staff and materials can be deployed to meet those needs. The goal is to limit delays as much as possible for the passengers. MeteoGroup’s weather forecasts and models should help to minimze costs and delays! Currently, the decision regarding whether to de-ice an aircraft is taken based on air temperature, but below-freezing air temperatures do not automatically mean that ice will form – or vice versa. Since the aircraft’s wing temperature is a much more accurate indicator, MeteoGroup used that temperature as a premise for its study. Using the mobile (road) weather sensor MARWIS, MeteoGroup studied temperature behavior using a special test wing at Schiphol – with surprising results. For example, wing temperature dropped to 8 degrees below air temperature on clear nights. The test also showed that wing temperature changes relatively quickly, by up to three degrees within twenty minutes. Furthermore, wing temperature is determined by factors other than weather. For example, fuel present from a previous flight may lead to fuel-induced icing. This graph shows the clear impact of cloud coverage (grey bars) on wing temperature (black line, measured by MARWIS). The blue line indicates the air temperature and the red line the dew point. To model wing temperatures, MeteoGroup has developed a specific energy balance model. This energy balance model calculates wind temperature by computing the various energy fluxes on the wing surface and adjusting them to account for weather parameters such as air temperature, wind speed, and cloud cover. The wing model calculates the ice type and quantity on the wing. Precipitation, for example, can occur as dry snow, wet snow, or rain on the wing, but may change in water or ice depending on the temperature of the wing. Specifically, it makes a big difference if wet snow or a thick layer of dry snow has to be removed from the wing (like on your car’s windscreen). Precipitation is a precondition here. Because the model anticipates both the type of precipitation and the timing, responses to weather conditions can be improved. That gives the airport enough time to ensure that sufficient manpower and materials are available to de-ice the aircraft. There are still more factors that the model can take into account, however, so that smoother departures can be guaranteed in poor weather conditions. Given this, MeteoGroup has submitted a new proposal to the KDC requesting permission to conduct further research to answer questions like: are there significant differences in the wing types of the various models of aircraft or does it matter where at the airport an aircraft is parked overnight? We will let you know as soon as MeteoGroup find answers on these questions, maybe again with support of MARWIS measurements! 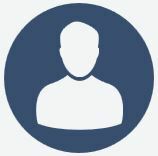 Freelance writers or employees of Lufft are writing regularly for this blog about measurement and control technology.